W.G Grace, Sir Jack Hobbs, Peter May, Herbert Suttcliffe, Graham Gooch and Sir Vivian Richards. What do they all have in common? Beyond their notability as batsman, these men have all entrusted their skills to a Surridge family cricket bat. In launching Swannack’s Kickstarter campaign – running until February 22nd 2018 – the Surridge family have reopened the Stuart Surridge & Co. Ltd archive. The highlight of the family’s collection are the antique cricket bats. All tell the story of a pinnacle moment in their owner’s career, resulting in a collection comprising of significant slices of cricketing history, most of which are signed mementoes of an innings or series. 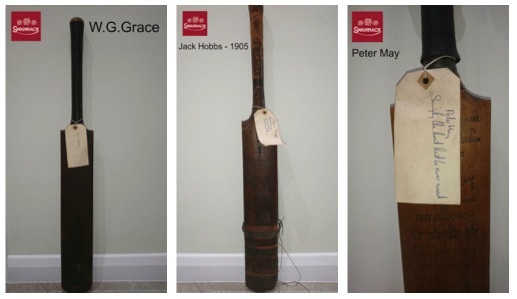 Here are just a few of the stories behind the Surridge family’s cricket bat collection. W.G Grace – It seems most journeys associated with cricket’s history have some origin at W.G Grace. The Surridge family is no different. W.G Grace is an enigma to today’s cricket historians. Grace is accredited with over 54,000 runs in First Class cricket.However, the extent to which this number is both true and fair is up for debate. So, like Old Masters paintings, Grace’s achievements should be viewed with a slither of skepticism towards their authenticity. Nonetheless, his achievements – whether within the ‘Spirit of Cricket’ standards upheld today – should be viewed with admiration. The greatest of these occurred during the 1876 season. Surpassing 3,500 runs that year, Grace accumulated 839 of these across an 8 day, three match period. The most remarkable being the then 28-year old’s 344 against Yorkshire at Cheltenham in the final match of this extraordinary passage of time. It would be only the second triple century scored in the history of First Class cricket, the first of which occurred in a game finishing five-days prior. The run scorer? You’ve guessed it. A Mr. W.G. Grace. Sir Jack Hobbs – Jack Hobbs is famed as a record breaker and maker. 61,760 First Class runs and 199 centuries for Surrey and England, Hobbs became the first professional cricketer to be honoured with a knighthood in 1953. Prolific in the top order, Hobbs is often referred to as simply, ‘The Master’. A self taught batsmen, Hobbs played professional cricket – always with a Stuart Surridge & Co. Ltd cricket bat – into his 50s, and is still Test cricket’s oldest centurion, passing three figures for England aged 46. His 155 in a match against Essex in 1905 marked a significant milestone both for Hobbs personally and for the Surridge family. For it was after this innings – at the end of a 2-year apprenticeship period with Surrey – that Hobbs was awarded his county cap. And the Stuart Surridge bat used by Sir Jack Hobbs to earn his inauguration into professional cricket remains in the Surridge family’s private collection today. Some of the original Stuart Surridge & Co. Ltd cricket bats in the Surridge family’s private collection.